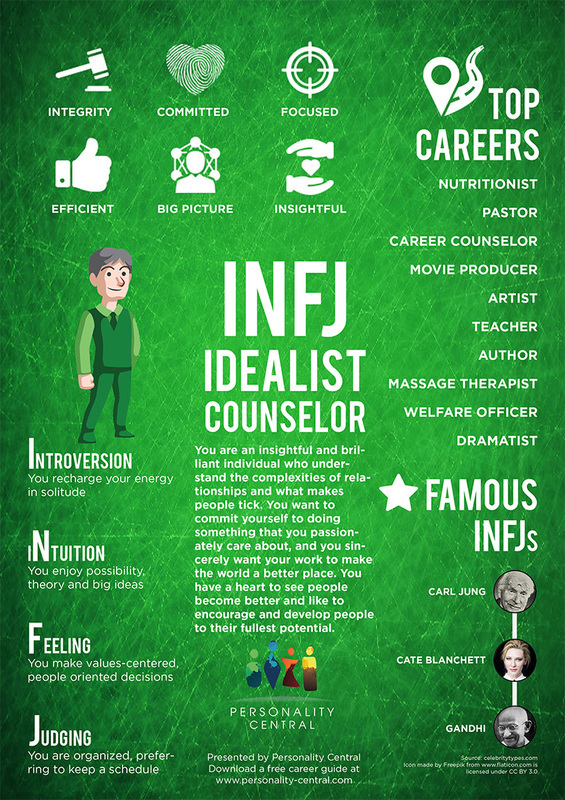 An individual who has an INFJ (Introversion, Intuition, Feeling, Judgment) personality type is often compassionate, imaginative, creative, idealistic, and prophetic. Sensitive and reserved, they feel as if their primary goal in life is to help others in need, like the homeless, abused women and children, those who are chronically or terminally ill, and animals that have been neglected, mistreated, or abandoned. They have a passion for aiding in rescue efforts and performing charity work. Their thoughts are filled with ways in which to prevent people from experiencing hardships. They like helping people, and they are good at it. People typically embrace the unique skill set of these “activists”—their gentle nature, strong opinions, and unflinching commitment to fight injustices and wrongs. INFJs are strong-willed (often confused with stubbornness) and highly decisive, but they rarely exploit these characteristics for personal gain; they use their gifts (imagination, compassion, and resourcefulness) to create balance in the world. People with INFJ personality types also believe in fairness and karma—what people put in, they shall receive. They strongly believe that the only way the world will ever emerge onto the right path is if people look deep inside their hearts and practice unconditional love and compassion toward others. INFJs truly believe that with this combination, people can soften the hearts of dictators and tyrants. They often try to find the meaning and purpose behind ideas and relationships, and they have an insatiable need to obtain material wealth. INFJs are intuitive and know what inspires others, which helps them to connect with others. Their warmth, calmness, and sensitivity keep them surrounded by loved ones. Most of all they treat people like people—not property, children, or employees. A positive quality they have is being cautious about overwhelming others with a barrage of facts and logical explanations. Friends, family members, co-workers, and romantic partners may describe INFJs as quiet extroverts who often need time to eliminate stress and recharge. Because of their natural tendency to advocate for others, it is important that they take care of themselves. They typically expend all their time and energy helping others, often at the detriment of their own happiness, health, and life satisfaction. They can quickly lose their energy, becoming stressed and exhausted. Confrontations exhaust INFJs most of all. In fact, they avoid conflict at all costs. They have a tendency to become irrational, upset, and even destructive if negativity is unavoidable. To combat these behaviors, they must practice relaxation and focusing techniques. Although INFJ personality types account for less than 1 percent of the general population, they play a significant role in the world. They have a natural inclination toward peace, idealism, equality, and morality. These individuals are highly capable of developing realistic steps that help them accomplish their goals, so they can make a lasting contribution to society. In general, INFJs can be demanding, especially when it comes to their work environment. This personality type needs to know that the tasks he or she is performing has purpose and meaning in line with his or her principles, values, and beliefs. An INFJ personality type needs to feel as if the work he or she is doing helps people grow and develop. They despise strict rules, rigid regulations, routine tasks, and dominant bosses, so in order for this personality type to be productive at work, it is best that his or her supervisor or manager refrains from micromanaging him or her, and encourage diplomacy, democracy, and independence. INFJs do best with bosses that are empathetic and personal. It is important to note that although INFJs tend to have an idealistic viewpoint, when they experience conflict, they are quick to abandon feelings of peace and harmony in favor of anger and bitterness. INFJs are hardworking, honest, and loyal employees and co-workers. They are capable of maintaining healthy work relationships and multiple responsibilities. Furthermore, INFJs often feel uncomfortable exercising dominance or authority over subordinates (employees); however, when in charge, others tend to value their input and humanity. They make great bosses because of they see everyone, regardless of position, as equals. They enjoy motivating, inspiring, coaching, and mentoring others over typical supervisory roles. It is important that INFJs find purpose and meaning in the work they do. In other words, they need to know that they are connecting to and helping others, especially those who are struggling or being treated unfairly. Therefore, INFJs do rather well in professions that help others. Many INFJs excel as nurses, physicians, psychologists, counselors, social workers, holistic practitioners, psychiatrists, teachers, medical technicians, life coaches, mentors, religious leaders, and physician assistants. They also excel in professions that allow them to freely express themselves, like in the entertainment arena. Therefore, it is common for someone with this personality type to become an author, singer, artist, photographer, designer, or actor/actress. INFJs excel in any area that promotes spirituality, morality, and personal growth. INFJs shy away from casual romantic encounters, preferring serious long-term relationships. They value in-depth connections and meaningful interactions with their partners. They take their time when getting to know someone. INFJs want to make sure that they connect with the people they hope to spend the rest of their lives with. Relationships are serious business to INFJs. Once they find the “right” partners, they experience a level of intensity, depth, and honesty that most people only dream about. However, if a partner or potential partner tries to manipulate, fool, or lie to an INFJ, he or she will be in for a rude awakening. INFJs are known for their warmth, friendliness, sincerity, compassion, and insight. They are picky about potential partners, and they have little time or patience for those who are deceptive. The downside of this personality type, in regards to relationships, is that INFJs can set their expectations too high. For instance, they may expect their partners to value the same principles or believe in the same things that they do, when in reality, their partners may have different beliefs and principles. The upside of this personality type is that INFJs are not afraid to show how much they cherish their loved ones. They offer unconditional love. They are committed to developing, genuine and deep connections with the people they love, regardless of whether it is a friendship, parent/child relationship, or romantic union. As parents, INFJs tend to foster loving and supportive relationships with their children. They raise their children to take into consideration the feelings of others and to see themselves as equal to others. INFJs are devoted to their friends, partners, and children, and would do anything humanly possible to help them, should they need assistance. The goal of INFJ parents is to raise warm, loving, compassionate children, who eventually turn into warm, loving adults.